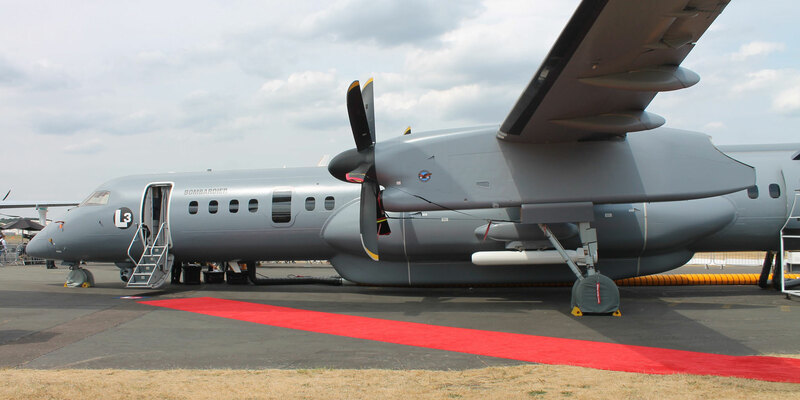 L3 Aerospace Systems flew its Q400 multi-mission aircraft (MMA) demonstrator to the Farnborough Airshow to make its international debut last week. The company has been developing this conversion of the Bombardier twin-turboprop airliner for more than five years. It has identified nine missions that can be performed, ranging from maritime surveillance through ISR to firefighting. There are “several interested customers,” Cliff Henry, senior program manager for airborne multi-mission systems, told AIN. Henry said that L3 evaluated the ATR42/72 and Airbus C235/C295 turboprops and the Embraer KC-390 jet airlifter before choosing the Q400. The winning criteria included a robust airframe with good climb and cruise performance, plus no need for modifications to the electrical or cooling systems. L3 took delivery of a green airframe from Bombardier as long ago as November 2012, to conduct initial flight tests. The modified MMA demonstrator made its first flight last November. The prominent, side-fuselage-mounted auxiliary tanks carry 10,000 pounds of fuel to provide an endurance of up to 12 hours but are removable when not required. The under-fuselage mission pod can be reconfigured with a variety of sensors, such as a rotating maritime surveillance radar, a side-looking multimode radar, SIGINT systems, and a line-of-sight datalink. Alternatively or additionally, ESM/ELINT system antennas can be provided on the rear fuselage. EO/IR sensors can be fitted under the nose and rear fuselage in retractable turrets. There is a wideband satcom antenna above the fuselage and provision for self-protection systems on the fore and aft fuselage. The rear side door can be opened in flight. Henry noted that L3 already has extensive integration experience with multiple sensors, having previously supplied modified P-3s, business jets, and turboprops to 14 countries. The standard onboard fit on the Q400 MMA of two operator consoles offers multiple sensor fusion, aircraft flight path control, and built-in datalink management. Up to four more operator positions can be provided. At Farnborough, the demonstrator was carrying a dummy lightweight torpedo attached to the port auxiliary tank. This indicated L3’s intent to develop anti-surface and anti-submarine warfare options, work on which will begin next January, Henry said.